After that, there's a 2 min rest, then cash out was 2 mins of hollow rocks. 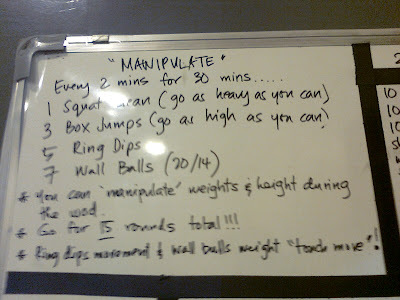 I used the 10 lb ball for the wall balls and the 12" box for the burpee-BJs. Looking at the board, I saw that my partner Dorothy almost made it to 5 rounds. She's really strong. 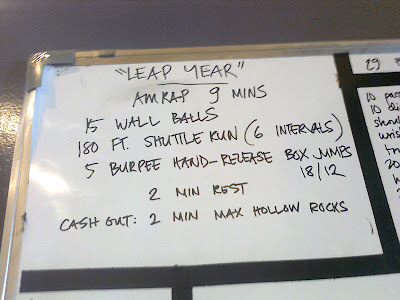 I was able to do 3 rounds, and was 2 box jumps shy of 4 rounds. So close! Anyway, I've been wanting to eat chocolate ever since the challenge started, and I'm now looking at some paleo chocolate cupcake recipes, thinking about how I can add tablea to the ingredients. Because I miss the taste of native hot chocolate made with tablea. I shall work on that this weekend. So we lost the head-to-head yesterday. The other team was able to do a hecka lot more than we did. Kinda disheartening. Wanna know something else that's disheartening? My muffins went bad. Yes, after only two days. Although it's partly my fault because I left them out, and now I realized I should have put them in the fridge. 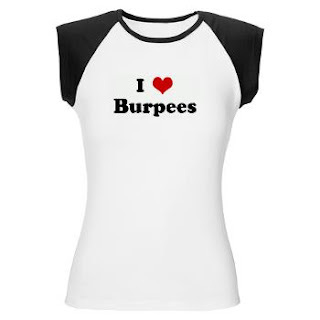 On the menu today was 7 mins AMRAP of... burpees. 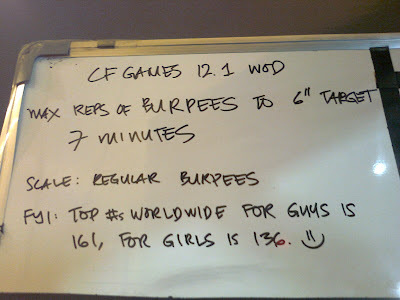 It is the first WOD for the 2012 CrossFit Games Open, which means that everyone who registered for the CF Games Open has to do it and post a video of their WOD on the CF Games website. After the Open, the top athletes go on to compete in the Regionals, and then the top 100 will compete in the CrossFit Games in California in July. Post-WOD, I worked on my double unders. I can do a double under followed by singles now. Progress, at last! And Lady fed us again, and this time she'd brought almond flour banana pancakes and homemade bacon. Yum. 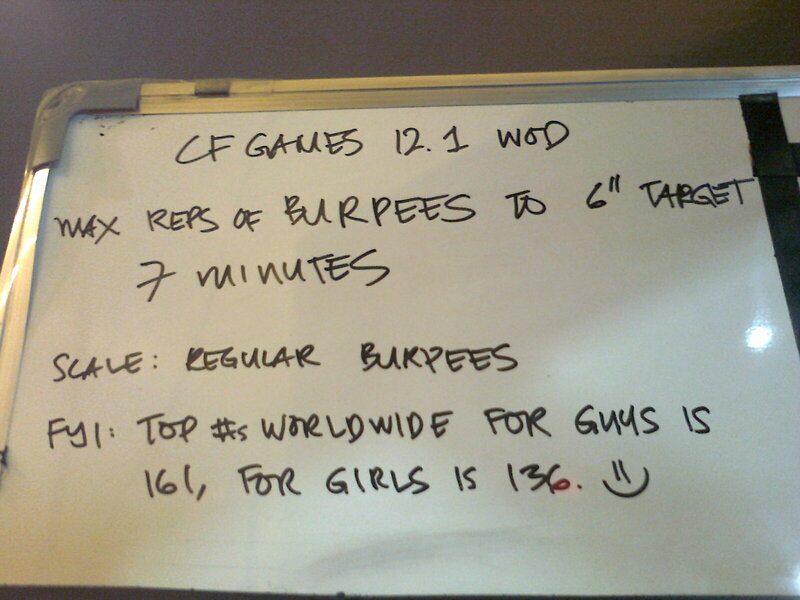 After a while the 12:30 class came in and we helped out in counting reps. Till we meet again, burpees! I felt so deprived that I couldn't eat my niece's chocolate cake so I took matters into my own hands and baked paleo banana muffins made with coconut flour. It turned out quite well, if I may say so myself. The original recipe I found here called for maple syrup but I omitted that and added another banana instead. It was moist, cakey, and a little bit coconutty. My father, however, complained that it tastes "different" and lacked sweetness. Preheat oven to 400F. Line muffin pans with cupcake liner. In a bowl, sift together coconut flour, cinnamon, nutmeg, and baking soda. Add the sea salt and whisk them all together. Set aside. Put mashed bananas in a larger bowl. Add eggs one at a time, mixing well after each addition. Add oil and mix well. Add the coconut flour mixture to the egg mixture and blend well. Mixture should resemble a thick pudding. If it doesn't, consider adding a little more sifted coconut flour. Spoon into the muffin pan and bake for about 20 minutes or until a toothpick comes out clean. Cool on wire rack. Don't look like paleo muffins, do they? Whoa, is it Day 11 already? Feels like forever since the last time I had bread, pasta, cookies, cake, and chocolates. I miss them when they're right in front of me, like today. My niece celebrated her birthday at Shakey's, and seeing the array of garlic bread, pasta, and cupcakes almost made me forget about the challenge. But whenever I felt like giving in, I reminded myself of how I feel now that I'm eating clean. My partner and I have head-to-heads scheduled next week and I don't want to eat cake and live with the thought that I might have done better had I not had that piece of cake. I know, I'm a nerd like that. Since I'm still doing push ups on my knees, Pau made me use a 25 lb plate to elevate the lower part of my body and make sure that as much as possible my thighs don't touch the floor (they still did). 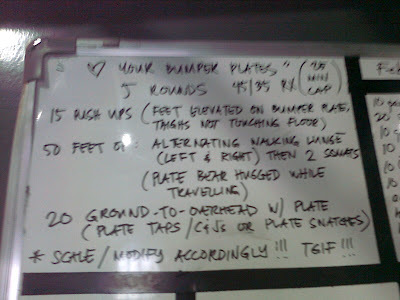 For the walking lunges and plate snatches, I used a 15 lb plate. I had just finished my 4th round when time ran out. Boo. Next time, plates! 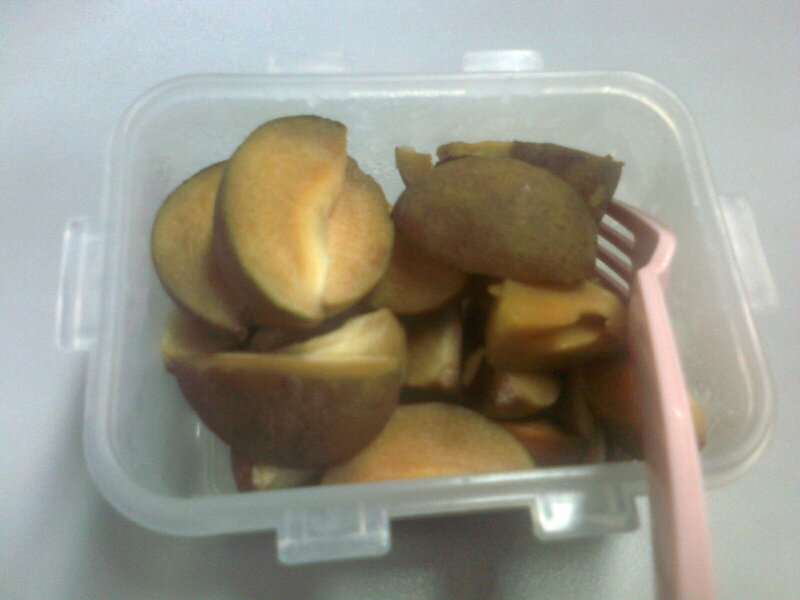 I cut up the chico fruits and chilled them in the fridge... sooo good! Wow, Day 9. One of the many good changes I'm liking about this lifestyle is I'm in a good mood most of the time. Does it come from the knowledge that I eat clean all the time? Maybe. All I know is, I like how it makes me feel: clean, light, strong, and chirpy. Nice to meet you, Megan! I used the 12 kg kettlebell for the kettlebell swings and did 105-75-45 single unders as I can't do double unders yet. I know, I know, I'll start working on them on Friday. My time: 8:44. Oh, and in other news, I got on the weighing scale and saw that I lost 4 lbs (down to 111.8 from 116 lbs). How could that be? I thought I'd gained muscle since starting CrossFit. Maybe I'd lost that muscle after going paleo? Or maybe I just need to eat more healthy fat. I'm not really sure, but I know that I need to tweak something in my diet and exercise routine. People have been remarking that I look like I've lost weight. My mother nags me about it every time she sees me dressed for a workout and it's starting to drive me nuts. I'm still feeling good and my energy level doesn't dip like it used to before I went paleo. There have been so many opportunities to cheat -- too many! -- but I've learned how to turn a blind eye on them. And I love that I don't get that heavy and full feeling after having a meal. I also rarely feel bloated. I could really learn to love this. At the beginning, I set up a 55 lb bar using a 35 lb bar and 2 10 lb plates. Then I thought maybe I should do what Belen did, which was to use a 25 lb bar with 2 15 lb plates (still 55 lbs), so I got 2 15 lb plates. I wanted to be able to go down to 45 lbs if I needed to. But I forgot to get a 25 lb bar, so I ended up doing 65 lbs for the squat cleans -- at least for the first half of the rounds. For the box jumps, I finally got up the nerve to use an 18" box. For the ring dips, I used the parallettes again, and for the wall balls I used the 10 lb ball. I did the 15 rounds! Yay! 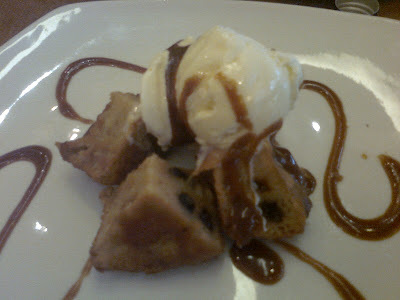 I met up with friends after Sunday service and we had lunch at Borough in Podium. I was kinda already starving by this time so I was glad to devour my salad, which would've been very paleo if not for the potatoes. My friends ordered burgers, sandwiches, and fries. To top it all off, as if to test my will and discipline, they had milk and cookies -- which looked very good and oh-so tempting. But no. I stuck to my resolve and managed not to use one of my 5 cheat cards. I was excited to see that they had coconut milk, because I'm planning to make paleo pancakes using coconut flour this week. See the slowest time there? That's me - 26:44. 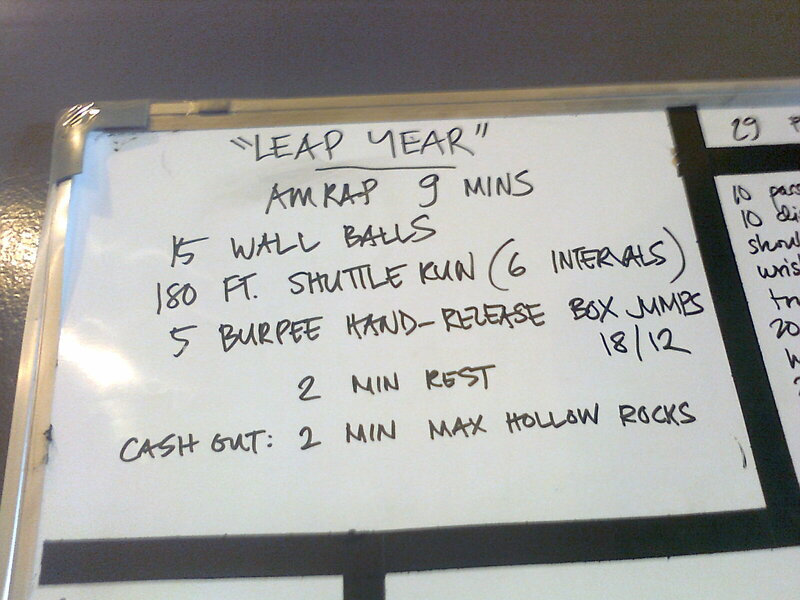 The good news is, my time can only go lower from here (I hope) and I should have a much better time when we do the same WOD on March 17. Post-WOD on the way home, I snacked on carrot sticks, and when I got home I made baked sweet potato fries again. The family loved it. See, paleo food CAN taste good! And they're pleased that I'm more active in the kitchen now that I need to prepare my own food. For today, I didn't have time to prepare breakfast again, so I only had a banana pre-WOD. I used the 10 lb ball and the 12 kg kettlebell. My time: 18:36. Post-WOD, Lady treated us to the paleo tacos she'd made and brought. It's just like regular tacos, except you use romaine lettuce leaves instead of taco shells. After that, we had coffee again - iced black Americano, and when I arrived at the office I had 2 hard-boiled eggs with a little salt. My afternoon snack consisted of one fresh saging saba and walnuts. For dinner, I had spiced chicken breast with fresh cucumber and carrot sticks, and fruits. My midnight snack was two pieces fresh saging saba. 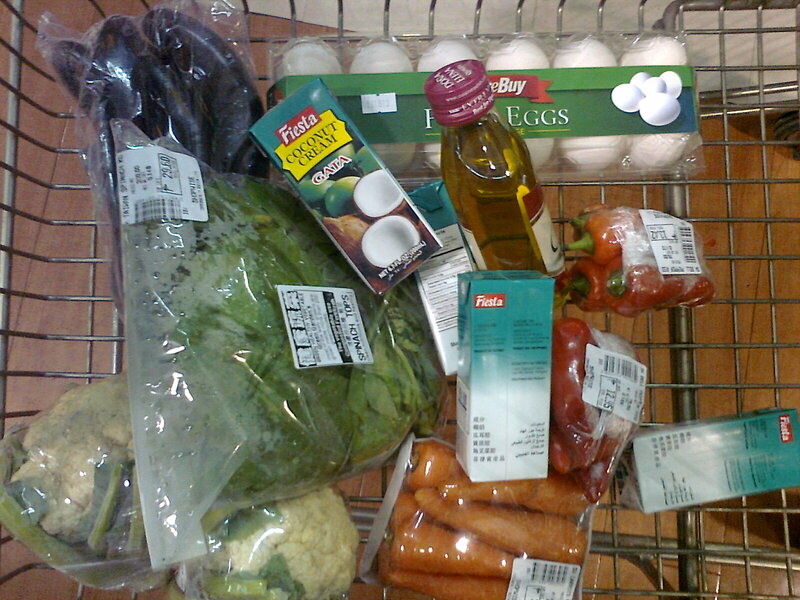 And so the Paleo Challenge begins. I didn't have time to make a decent breakfast this morning so I just had a banana before going to the box. After that, there was a 2 min rest, then 1 min AMRAP of cleans using the same weight doing the front squats. I used the green band for the CTB pull ups, the 12" box for the box jumps, and 45 lbs for the front squats and cleans (my 1 RM for cleans is 65 lbs). No, I'm still not brave enough to try the 18" box. 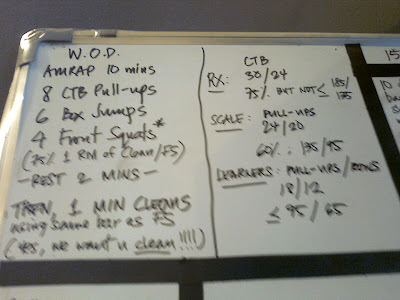 I did 7 rounds and 7 cleans. So-so. After the workout I had coffee (iced Americano, straight up) at Starbucks with some of the crossfit moms, and when I got to the office I had the scrambled eggs with tomato that I'd made in the morning. What? The paleo diet says eat when you're hungry! Hence the snacks. Well, so far, so good! Now, only 29 days to gooo! Today wasn't strength day but we did lots of cleaning and jerking, plus lots of sit ups, too. It would be more complicated than that if you do it Rx, because as the number of reps decrease, your weight is supposed to increase. Such that on the last set, you're supposed to be doing something 1 RM (rep max), or something like that. 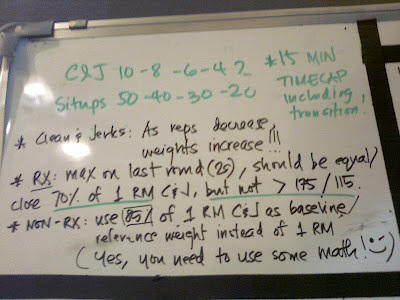 For those not doing Rx, the reps for clean and jerks were doubled. 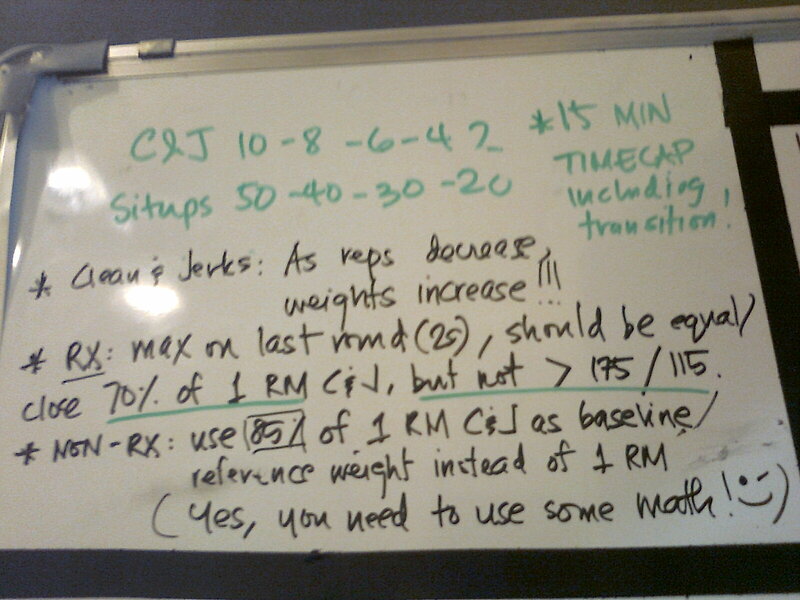 So that was 20-16-12-8-4 for us non-Rxers (I used the 35 lb bar). But wait, that's not all. There was a time cap of 15 mins. I made it up to the 30 sit ups, and for the first time in months, I DNFed. Sadness. :( It was the sit ups that got me, which means this is something I really have to work on. There was a 1 min rest in between rounds (so that's after every 3 min AMRAP), which brings the total workout duration to 19 mins. I used the 12" box for the box jumps and the 12 kg kettlebell for the kettlebell swings. Our score was the total number of completed rounds that we were able to do in those 5 rounds. My score: a measly 11. :( I must learn to take less rests and push myself more. 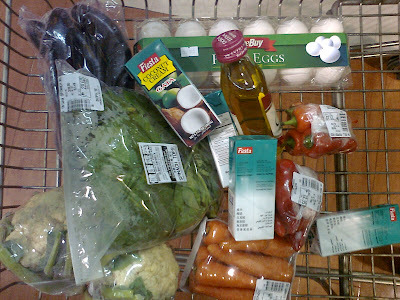 Five days before the Paleo Challenge starts! 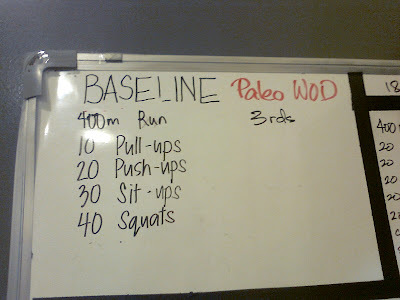 After the WOD, some other crossfitter moms and I had a pre-paleo lunch binge at Old Vine. We had salad, bread, pasta, and meat. And dessert too, of course. That was good. Man, I'm going to miss sugar. Thank God we didn't have to do another benchmark WOD today. 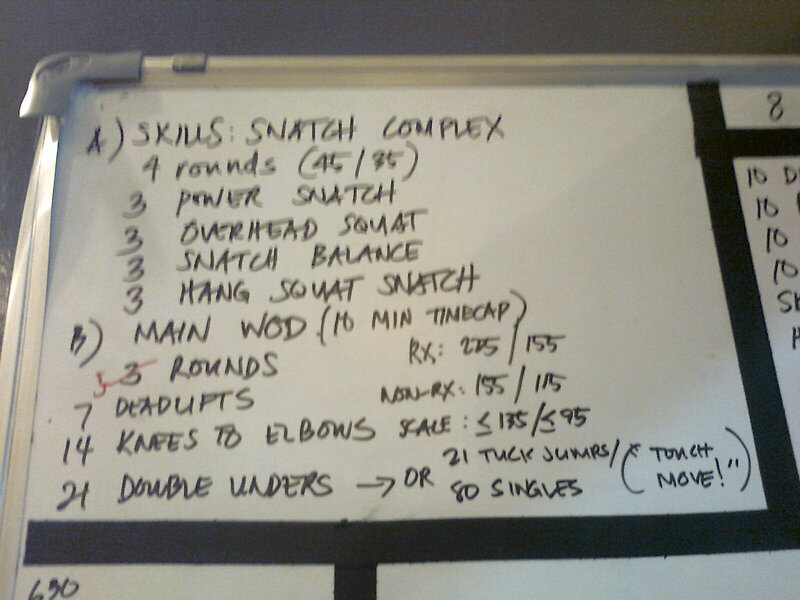 We worked on our snatches first before doing the main WOD. I used the 15 lb bar for the power snatches and the 25 lb bar for the other exercises. It made me realize how much work my core still needs. I was supposed to do 95 lbs for the dead lifts, but when Miggy changed the number of rounds from 3 to 5, I went down to 75 lbs. And since I still can't do double unders, I did 80 singles instead. Exactly 1 week to go before the Paleo Challenge... tick tock, tick tock! I was able to eat clean the whole day yesterday. Let's see if I can do it for 2 days straight. On Friday, some of the girls at the box and I are having a pre-paleo binge after the 10 am class. Can't wait! 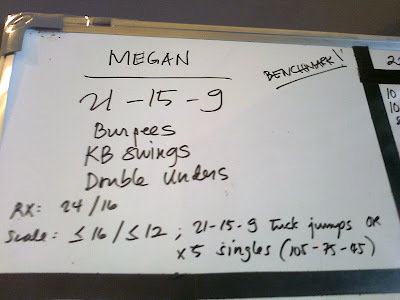 Another benchmark hero WOD today, and it was all about the upper body. 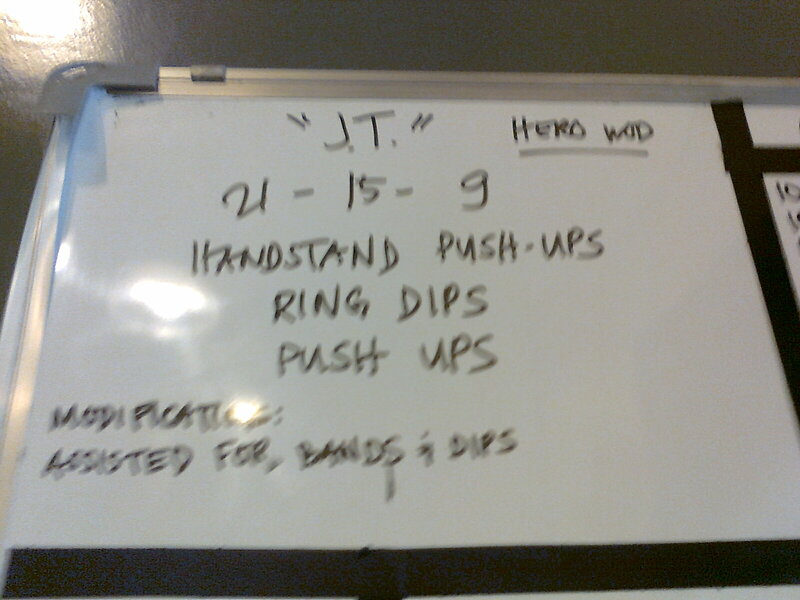 I still don't trust my core enough to try the band-assisted handstand push ups. I tried it once and it felt like my back was breaking. So I did the HSPUs while kneeling on a box with my head upside down. For the ring dips, I used the parallettes with my heels on a 12" box. And for the push ups, I did them on my knees again. My time: 10:41. More people are starting to come in for the 10 am class so I think the schedule is safe... for now. In my desire to encourage my son to continue being active, I told him we'd be running today. Although I'd contemplated going to the box, spending time with my son is still my top priority. I only see him on weekday mornings so I make sure I have time for him on weekends. He's a member of his school's football team, and thanks to a book I got on football for youth (it was a steal at P98 at a book sale) I learned that he needs to develop his endurance. So this afternoon, we got dressed and went for a (very short) run. 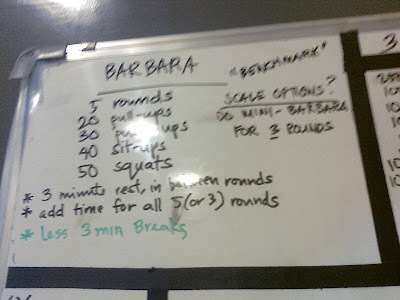 Today we did Barbara, which is a "benchmark" WOD. These special WODs are meant for people to test their fitness. 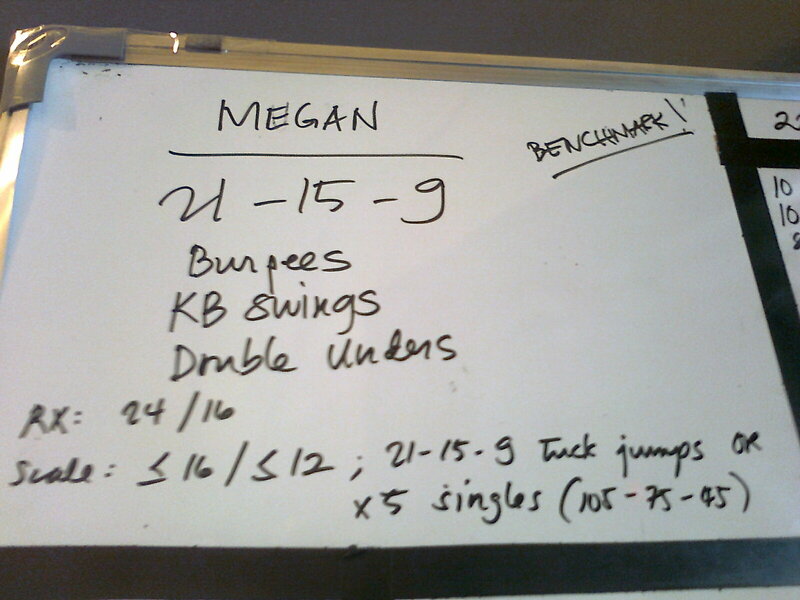 People record their time so that the next time they do the same benchmark WOD, they will see if they've improved (or not). At the beginning I was thinking of doing 5 rounds, but I changed my mind after the 2nd round and stayed with mini-Barbara, which is only 3 rounds. 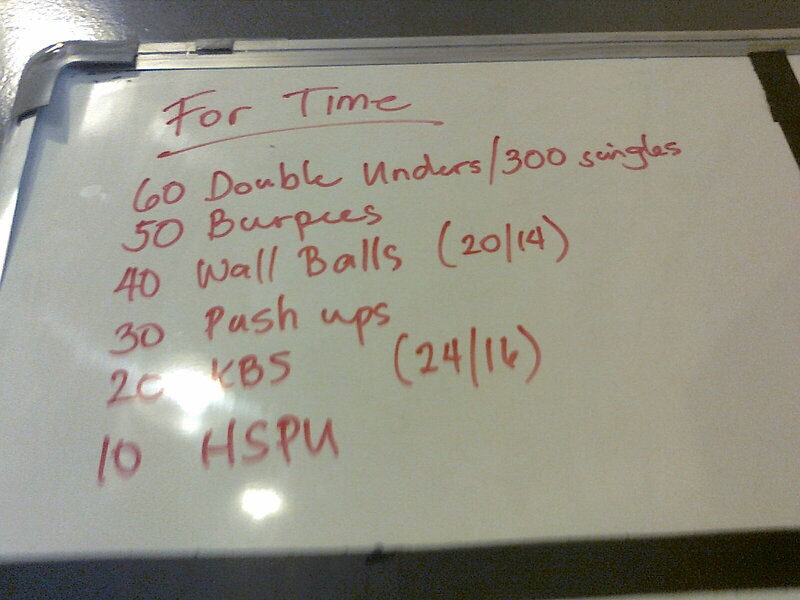 Although there was a 3 min rest in between rounds, it was still one of those especially kickass-y WODs. 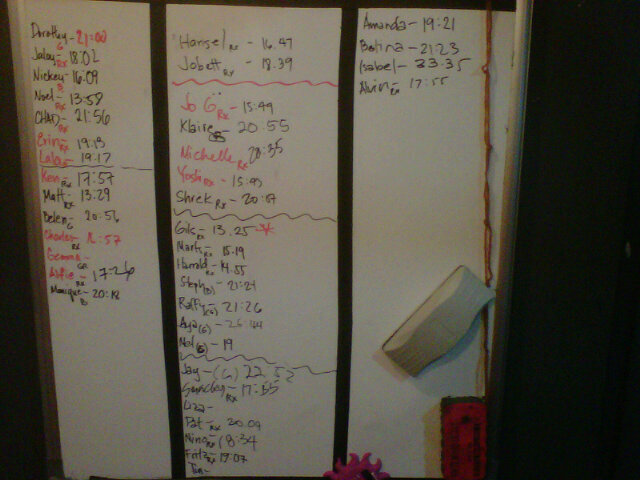 My time (not counting the 3 min rests): 21:21. In other news, I'm having such an un-paleo day. In the morning, I had peanut butter with my banana. Then I got a salad and cream of mushroom soup with bread from Sbarro for lunch. Now, I'm having cafe mocha. And later, I'm eating chocolate. I'm as far away from paleo as I could get. No matter, I'll get back in the saddle tomorrow! Back when the "renegade" coaches were still there, I remember doing less lifting and more body weight exercises. But I noticed that since I started working with the other coaches, there have been more barbell work. Which is good, in a way... I guess... unless it's an exceptionally kickass workout. It's a love-hate relationship I have with those bars. I love them because I know they're helping to make me strong, but I hate them because they make me feel so weak. I used the parallettes for modified ring dips, the 35 lb bar for the OHS, and the 10 lb ball for the wall balls. My time: 18:31. On the board, I saw that Nickey did it in 9+ mins. Unbelievable.